Whether its tranquillity you seek or the agility and stamina to move on; Kratom can be used to reach the state sooner with the help of various substances like Agmatine. You can forget the pain and relax now since your reliance on Kratom now may be invigorated by Agmatine. Kratom helps with several ailments and pains, this is known to everyone, but did you know that you can potentiate the effects of Kratom with another natural substance that may improve results while maintaining your dosage? The effects of Kratom may be enhanced by many other items that have a positive impact on the nervous system. One such potentiator and complementary substance are Agmatine. Agmatine is a derivative of amino acid I-arginine and is known for assisting the nervous system and providing better neurotransmission and modulation. Therefore, when combined with Kratom it can help kick in the soothing effect or even energize the nerves and refresh the body systems. We all have a favorite Kratom strain! Some people like the soothing effects of Red Vein Kratom while others may prefer the white strain. After trying and testing various Kratom strains, you can also find the one that suits your conditions the most. The next step will be to identify the kind of potentiator you require to enhance its effects and benefit fully from your daily dosage. For different purposes, a wide variety of potentiators have been suggested. Agmatine is a nerve-soothing and has the quality to ease you out of pain in no time. This is due to its positive impact on the nervous system. Coupled up with Kratom, Agmatine helps combat chronic conditions to provide lasting tranquility. Unlike Kratom, Agmatine is an amino acid compound, which is also produced by our bodies. As a naturally occurring substance, this may help in calming and relaxing the nervous system and reducing depression. All those suffering from depression may have heard of this compound. What Does Agmatine Help With? According to a study on the “effect of Agmatine on the development of morphine dependence in rats” published by the U.S. National Institute of Health, it was observed that the rats that were given morphine with Agmatine had reduced the morphine dependence. The rats that were given morphine only showed withdrawal symptoms, while the Agmatine-fed rats showed fewer symptoms as this indicated less dependence. The amino acid has been a pre-workout supplement to improve physical performance and provide energy. The neurotransmitter properties of Agmatine make it an ideal substance for all those who seek better bodily functions and a stronger nervous system. This is possible since Agmatine helps reduce stress and soothes the nerves. Since Agmatine is also a natural compound, the use of this reduces drug dependence. People suffering from depression often rely on opioids and that sedate the nerves, causing slow reflexes and drowsiness to prevail. Agmatine may help get rid of drug addiction crave as it is not an opioid. Therefore, it may help relieve pain by calming the nervous system. If used for a long time, an individual’s body tends to build resistance that is why different kinds of combinations to boost the effect of Kratom may be a good option for those who want relief in a short period. Agmatine frees your body off from building resistance against substances used for pain relief. Apart from depression, Agmatine can also help reduce the risk of Alzheimer’s. This compound has a quality of locating receptors in the body and palliate nerves. This action also helps reduce diabetes and mood swings due to chemical imbalances. Agmatine has helped people with severe conditions and promote muscle growth. An amino acid is the right kind of potentiator to match the calming effects of Kratom with the ability to relieve unhealthy conditions and pain. As mentioned earlier, Agmatine is produced in the body, but also found in fermented foods and supplements created to enhance Agmatine levels in the body. So, if you feel upset or helpless and need to release all the stress and tension, Agmatine and Kratom are a quick fix for you. You can find Agmatine sulfate pills easily from any pharmacy. The different potency options can help you to begin your dosage. How Often Do I Take Agmatine And Kratom? When you are on Kratom, you are advised to adjust the optimum dosage according to your body needs. Similarly, when you decide to start Agmatine supplement; remember to start with the lowest dosage and move up till you find the right effect. You must give a break after a few days of regular intake of both the supplements. If you keep taking this regularly, your body might build resistance against it, and you will end up the increased dosage, which might have some unfavorable side effects. This is why it’s always better to give a short break between doses. After all, you would definitely want to get the best out of Kratom alkaloids! Whenever you decide to add Agmatine to Kratom dosage, you may find out the right amount to suit you. By starting with minimum and finding your optimal balance; remember never to exceed this dosage. Kratom has limited side effects, but you might stop seeing the results that you desire. What Is The Desired Dose Of Agmatine? According to the users who share their experiences on social media and different Kratom user groups, we have found out some values that may be helpful to readers. You may start with a low dose like 200 milligrams of Agmatine and see how it helps. Just like increasing Kratom dosage will help you find the right amount for you, Agmatine dosage can be adjusted to suit your body. Some people have reported that consuming 500mg of Agmatine helped them lower their dose of Kratom. They experienced the desired results without having to increase Kratom intake. Every individual has a different system and may require different dosage. The threshold for one person may be higher than another’s due to physical conditions and history of Kratom usage. What Kind Of Effects Can I See By Combining Agmatine And Kratom? Besides the few effects, we listed above, you may experience a blissful release of energy as the substances tranquilize your nerves. You might feel in control and may even gain the self-confidence you require to make the right decisions since there will be no worry or stress to hinder rational thoughts. Agmatine For Kratom Tolerance: What Do People Say About This Mix? Thousands of Kratom users have proved that combining Agmatine to their daily dosage has reduced their tolerance to Kratom. The combination might help you achieve the results you want, without bringing about a stage where your body might build resistance against the supplement. People post their daily experiences on different forums, and they share their joy by telling others how they experienced a better effect from taking Agmatine with Kratom. For instance, a user posted a query on a social media page about how people think Agmatine and Kratom is the right combination and the answers were enlightening. Some people mentioned words like uplifting, exhilarating, powerful, contentment and even heaven! Regarding the time needed to achieve a pain-free and stress-free state, users reported immediate relief that lasted up till 10 hours even! When you utilize this combination, you might see positive results sooner than before, and it won’t end that soon; giving you lots of time to soothe your nerves and start afresh! 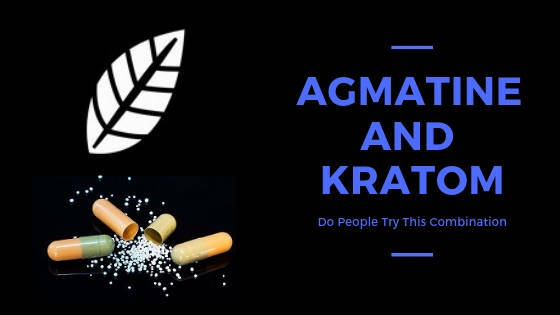 For athletes and people who require physical strength on the job, Agmatine and Kratom combined may provide the best solution to work well while the wounds heal and cause no pain! Just like the ingredients will ensure the better taste of food, the best quality Kratom strains, and Agmatine stacks may help you get good results. If you buy your supplements from unofficial sources, there is always a chance you will end up experiencing less than what you paid for! Make sure to choose the best supplements from a reliable source. Kratom is a perfect natural agent to increase potency, but users need to be careful with what they combine with their dose to increase the effect. Agmatine is a safe opioid, but you must not exceed the amount that is right for your body.